Once he made the decision to go with the suicide front suspension, Lyle had plenty of room for a good old hot rod motor. 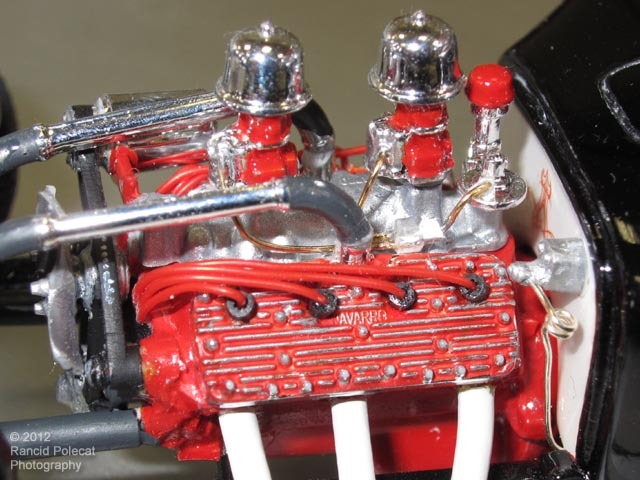 He selected the flathead from the most recent edition of the Revell '48 Ford kit (Custom Coupe 3'n1) which features the first-ever renditions of Navarro dual pot intake manifold and cylinder heads in 1/25 scale. With paint detailing, red sparkplug wires, and copper wire fuels lines, Lyle's flattie V8 is quite convincing.